Imagine how we were all amazed when in midstream on Episode 17, he turns into a Blues Singer (term used loosely). Well … the only one we had at the moment anyway. We haven’t said much to Michael Shawn about the entire affair, we don’t want him to start acting like “talent”, getting sensitive and all. 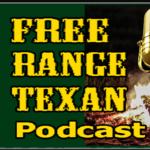 Episode 17 begins a season of premier announcements for things to come on our Free Range Texan podcast. Word on the street is the Free Range Texan network is looking for a new roving reporter personality. We’re certain Michael Shawn will shine more light on this subject soon.